The organisers of Keynsham’s celebration of youth have thanked everyone who helped make the day a success. Youth Fest 2012, on September 22, saw the Memorial Park filled with different activities from bowling to BMX demonstrations. The fun kicked off with a parade along the High Street, before a theatrical performance written specially for the Olympics and Paralympics, Battle for the Winds. Visitors to the Youth Fest were welcomed by councillors Gill Hellier and Roy Staddon, of Keynsham Town Council, and chairman of Bath & North East Somerset Council, Councillor Rob Appleyard. The Bandstand played host to a variety of acts including African Sambistas, Signpost Puppet Theatre, Freedom Dance Group, Sue Hill School of Dancing and Keynsham (2386) Air Cadet Squadron. A spokesperson for the town council said: “The finale of dance and music on the Bandstand brought together the many youth groups of the town, members of our local police force and youth service, which was great fun. 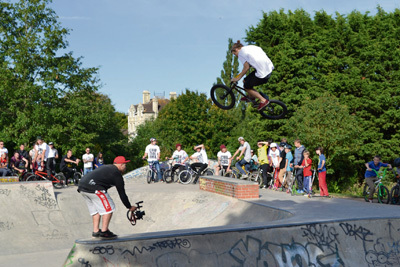 BMX demonstrations by Crucial BMX also drew a crowd to the skate park and spectators also had the chance to try some stunts themselves. Somerset FA provided an inflatable football pitch, which hosted matches for youngsters during the day, and Bath Rugby and Keynsham Rugby also entertained the crowds with demonstrations. Members of St John Ambulance and Keynsham Lifesaving Club were also on hand to share their skills, while other activities included fishing and bowling taster sessions, a range of stalls and a chill-out zone. Any lost property from the event can be collected from Keynsham Town Council offices at 15-17 Temple Street.